Iron Lake is a 247-acre, spring fed lake filled with trophy class bluegill, crappie, perch, largemouth bass, and huge northern pike. Top O' the Morn Resort sits on nearly 1,000' of pristine, south-facing frontage – and includes the ONLY semi-public boat landing on the lake. 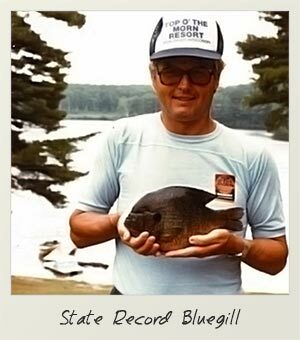 While Iron Lake has always been known as an outstanding fishery, the legacy really took hold in 1982 when a state record bluegill was caught by one of TOTM's guests. Even though the record no longer stands, pan fishing continues to be outstanding – and a huge draw for anglers of all ages. The lake is also known for huge northern pike and largemouth bass, so there's trophy potential everywhere! As a spring-fed lake with an outfall to the start of the Iron River, the water quality is superb. We have a total of nine docks spread along our lakeshore and some of the very best fishing can be found without the need of a boat – great for kids! If you're looking for other fishing adventures, the opportunities are endless! 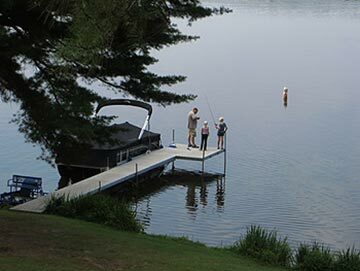 Bayfield County has nearly 1,000 inland lakes – 398 of which have public access – and is home to over 20 species of fish. There are over 400 miles of rivers and streams – including the Bois Brule River – for some of the finest fly fishing in the state. 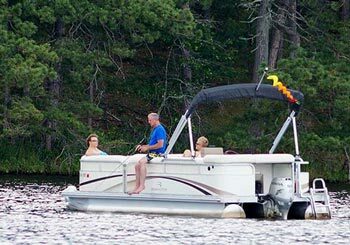 We're ideally located less than 10 minutes from the Pike Chain of Lakes, 30 minutes from the Eau Claire Chain of Lakes, and only 30 minutes from premier big lake fishing on the Chequamegon Bay of Lake Superior. So from musky to walleye, lake trout to world-class smallmouth fishing, your premier northern Wisconsin fishing experience starts at Top O' the Morn Resort. But don't be fooled...some of the biggest trophies are often found in the most unsuspecting bodies of water! When the weather turns cold and the water turns solid, the fishing is just warming up! 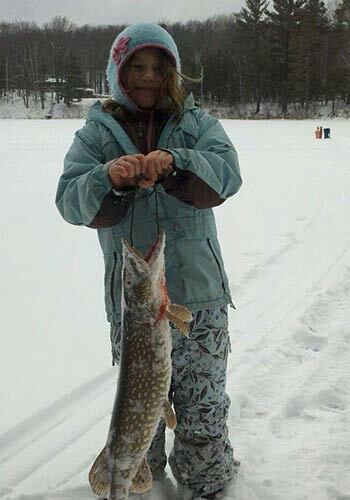 Northern Wisconsin has some of the most abundant, accessible and unsung ice fishing lakes in the Midwest. With a local culture built upon the ice fishing experience, you'll find a variety of structures scattered on almost any body of water you see. Now is the time to sneak back into a hidden wilderness lake that might otherwise be limited during the summer months and enjoy the pristine, uninhabited setting – and incredible fishing. With only a sled, an auger, and a bucket of supplies, access to tremendous fishing is literally unlimited. Try your favorite summer fishing hole (without the pressure), or explore uncharted waters. Roast marshmallows or hot dogs with the kids and wait for the race to begin...FLAG!